If you live in, or are thinking about traveling to, the DC-metro area this weekend, do yourself a favor and check out the Bicycle Film Festival. My frequent partner-in-crime Sean O’Donnell and good friend Nick Barkley (DC BFF Director) have put in huge days to make sure this year’s festival is bigger and better than ever. Nick and Sean take the DC BFF reins from last year’s director, Chris Carraway, who built a strong foundation with the 2010 festival before deciding to spend this summer, at altitude, preparing to bring the pain to you Mid-Atlantic cyclocross cats. The festivities for the 2011 DC BFF kicked off Thursday night with a cash-for-cash sprint competition on the streets of your nation’s capital. After that prologue it is Friday’s program when things really get rolling. Programs start at 7pm and 9pm at the beautiful Gala Theater in Northwest DC. When the final screening ends but before the projector is even cool, the after party will be hotting up at nearby Wonderland Ballroom. On Saturday there is so much going on it just gets silly. The party starts with a 1:30 Hold Fast and B-More Fixed “Fixt Trix Jam” at the Bridgespot Skatepark. Word has it an alleycat race will be taking place about that time, too. After that, get ready for four separate programs of the best bicycle films the world has to offer. And it doesn’t end there. Saturday night becomes Sunday morning with a blowout after party at DC9. If you make it that long, please do me a favor and buy Sean and Nick, or one of the other volunteers that make this event possible, a beer. They truly deserve it. 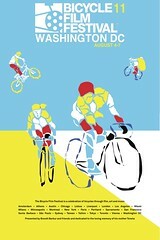 And, oh by the way, we here at the CXHairs have a short film playing Friday at 7:00 pm. Would love to see all of you come out. Every film in that program is solid. And one (ours) is about a cross race. In a junkyard. Oh, the shenanigans. You won’t want to miss it. So come on out and play. Cross is still more than a month a way. Enjoy yourself. The trailer is awesome and the film is going to kill at the BFF. Family is heading to Jersey this weekend, so we’ll miss it, but best of luck and enjoy!! Next Next post: Are You Ready For Some Cyclocross? Really, Are You Ready?